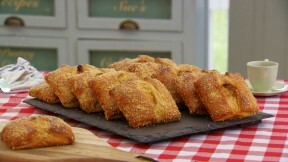 This flauones recipe by Paul Hollywood is the technical challenge recipe in the Pastry episode of Season 3 of The Great British Baking Show. It is explained in further detail by Mary in Masterclass: Part 3. For the filling, grate the pecorino romana and halloumi into a large bowl. In a separate bowl, mix the plain flour, semolina, yeast, dried mint and sultanas together. Beat the eggs and milk together in a jug. Tip the flour mixture over the cheese and pour over the egg mixture. Mix together with your hands. Cover and leave to stand while you make the pastry. For the pastry, tip the flour, mastic powder and mahlepi into a mixing bowl. Add the sugar and salt to one side of the bowl and the yeast to the other. Add the butter into the center of the flour with 12fl oz of the milk. Combine the ingredients to form a soft dough. Gradually add the remaining milk - you may not need it all. Place onto a floured surface and knead until smooth. Place back in the bowl, cover and leave to rest for 1 hour. For the glaze, place the sesame seeds, vinegar and enough water to cover in a small saucepan and bring to boil. Drain well and spread the seeds over a clean tea towel to dry. Preheat the oven to 375F. Line 3 baking trays with non-stick baking parchment. Divide the pastry into large pieces and roll out on a lightly floured work surface until about ⅛in thick. Using a saucer as a template, cut into 12 x 6in rounds. Firmly press one side of the pastry rounds into the sesame seeds to coat. To finish the filling, add the baking powder to the filling mixture and divide the filling into 12. Place one portion of filling into the center of each dough circle and fold in 3 sides to make a rounded triangle shape, leaving a gap in center with the filling exposed. Place the flaounes on the baking trays, brush the tops with the beaten egg yolk and bake for 15 minutes. Reduce the oven temperature to 350F and bake for a further 15 minutes, or until golden-brown and puffed up. Serve hot or cold.